In the past, the treatment of cystinosis was limited to treating metabolic acidosis and, often, replacing electrolytes lost in the urine; later during the course of the disease, chronic kidney disease (CKD) was treated. Today, the wide availability of an effective drug, phosphocysteamine, and kidney replacement therapy with transplantation has dramatically improved the outlook for patients and altered management strategies. Replacement of urinary losses: The child must be well-hydrated and administered supplements of potassium and bicarbonate, as needed. Rickets should be treated with vitamin D and phosphate supplementation. Carnitine may also be needed because its excretion is particularly elevated in the urine, and muscle levels have been documented to be reduced. Particular care should be given to fluid and electrolyte therapy during intercurrent episodes of fever, vomiting, or diarrhea. Initial management of volume depletion in a child with cystinosis requires administration of large amounts of fluids and electrolytes, often exceeding conventionally defined limits. Fluid requirements may be more than twice that expected for the patient's size. Urinary losses must be carefully monitored and replaced during hospitalization. The rehydration fluid should contain glucose, sodium, potassium, and bicarbonate (in amounts generously exceeding the standard intravenous fluid composition). The concentration of these substances should be adjusted on the basis of frequently measured serum laboratory values. After rehydration is accomplished, maintaining free access to water or other fluids is important because patients with cystinosis easily become dehydrated. For example, place a water container at the bedside during the night. When the patient becomes free of acute GI symptoms (ie, no longer having frequent episodes of vomiting, gagging, abdominal pain, or diarrhea) and is able to eat well, restart the patient on a regular diet, supplementing individually determined amounts of sodium, potassium, bicarbonate, and phosphate to achieve reference range serum levels. Indomethacin may limit water losses in patients with nephropathic cystinosis by both reducing the glomerular filtration rate (GFR) and by sensitizing the collecting duct to the effects of antidiuretic hormone. It has been used to treat patients with cystinosis more commonly in Europe than in the United States. In uncontrolled clinical reports, indomethacin has been shown to relieve polyuria and polydipsia and to improve appetite, energy, and general well-being by reducing urinary losses of water and other various substances. Indomethacin therapy requires careful monitoring of kidney function because the GFR may be worsened by the administration of this drug. The ulcerogenic potential of indomethacin is its major drawback for treating cystinosis. Treatment with recombinant human growth hormone improves growth velocity. Long-term recombinant human growth hormone treatment in young children with nephropathic cystinosis prior to renal replacement therapy is safe and efficient. Growth hormone treatment is less effective for peripubertal or adolescent patients on renal replacement therapy. Treatment with recombinant human growth hormone does not accelerate a decline in kidney function in children with chronic kidney disease. Thyroid replacement: This is indicated in patients diagnosed with hypothyroidism. Kidney transplantation: Kidney transplantation in patients with infantile cystinosis corrects kidney failure and prolongs survival (the donor parenchymal cells are not homozygous for the genetic defect and are therefore able to transport cystine from the lysosomes). However, transplantation does not prevent progression of the disease in other nonrenal organs, and therapy with oral cysteamine is indicated in patients after kidney transplantation. Management of cystinosis with oral Cystagon must be initiated as soon as diagnosis of cystinosis is made. Ocular complications associated with deposition of corneal cystine crystals include photophobia, eye pain, squinting, corneal haziness and foreign body sensations. Severe cystine crystal accumulation can damage the cornea, resulting in serious vision difficulties. Oral cysteamine is not distributed into the eye and thus has no impact on corneal crystal accumulation. Cysteamine ophthalmic solution 0.44% (Cystaran) was approved by the US Food and Drug Administration (FDA) in October 2012 for corneal cystine crystal accumulation in patients with cystinosis. Corneal crystals reaccumulate if cysteamine ophthalmic solution is discontinued. Images demonstrating the course of cystinosis are shown below. An 8-month-old male infant at the time his cystinosis is diagnosed. 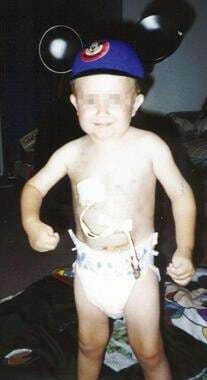 The same child as in the previous image, at age 20 months, fed via gastric tube. 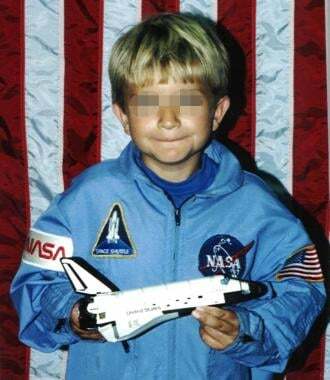 The same child as in the previous images, at age 3 years, fed via jejunal tube. The same child as in the previous images, at age 4 years, on total parenteral nutrition via central line. The same child as in the previous images, at age 9 years, off total parenteral nutrition for 1 year and tolerating oral intake. Some patients with severe gastroesophageal reflux may require gastric/jejunal tube placement or Nissen fundoplication to achieve optimal nutrition. Nephrologists usually diagnose cystinosis as the cause of Fanconi syndrome. The patient must be referred to an ophthalmologist upon initial evaluation and at subsequent regular intervals. Regular follow-up by pediatric nutritionist is recommended in patients with poor growth. A pediatric endocrinologist may provide follow-up care for the patient related to growth hormone therapy, thyroid insufficiency, or diabetes mellitus. Patients with recurrent abdominal pain, poor feeding, or vomiting and/or diarrhea should be evaluated by a gastroenterologist to diagnose the nature of GI abnormalities (eg, swallowing dysfunction, gastroesophageal reflux, delayed gastric emptying, gastric/duodenal ulcer, pseudo-obstruction). Some children may require follow-up care by a behavioral therapist or a dietitian, depending on the child's needs. Because of various neuromuscular problems, patients in late adolescence require follow-up by a neurologist. Patients should be referred to an early intervention program to evaluate and treat common fine-motor movement and coordination delays. Dietary recommendations should follow daily Dietary Reference Intake (DRI) requirements (ie, 60% carbohydrate, 10% protein, 30% lipids), and caloric intake should aim to achieve weight gain. If the patient is a poor eater and oral feeding is unsuccessful, high-calorie oral supplements should be administered. If the patient does not take supplements or has an inappropriately low intake because of poor appetite or vomiting, gastric tube placement can help. Total parenteral nutrition is indicated if a cystinotic patient cannot tolerate any form of enteral feeding. Some patients may need additional therapy with agents improving GI kinetics or antagonists of acid production. Because of the chronic nature of the disorder, parents should try to accommodate the child's medical needs, while allowing the child to grow and develop similar to healthy children. Parents should encourage play and group participation. Nesterova G, Gahl W. Nephropathic cystinosis: late complications of a multisystemic disease. Pediatr Nephrol. 2008 Jun. 23(6):863-78. [Medline]. [Guideline] Scottish Intercollegiate Guidelines Network (SIGN). Diagnosis and management of chronic kidney disease. A national clinical guideline. Edinburgh (Scotland): Scottish Intercollegiate Guidelines Network (SIGN); 2008. [Full Text]. Procysbi (cysteamine bitartrate) [package insert]. Novato, California: Raptor Pharmaceuticals Inc. August 2015. Available at [Full Text]. Chevalier RL, Forbes MS. Generation and evolution of atubular glomeruli in the progression of renal disorders. J Am Soc Nephrol. 2008 Feb. 19(2):197-206. [Medline]. Besouw MT, Bowker R, Dutertre JP, et al. Cysteamine toxicity in patients with cystinosis. J Pediatr. 2011 Dec. 159(6):1004-11. [Medline]. Van Stralen KJ, Emma F, Jager KJ, et al. Improvement in the renal prognosis in nephropathic cystinosis. Clin J Am Soc Nephrol. 2011 Oct. 6(10):2485-91. [Medline]. Andrews PA, Sacks SH, van't Hoff W. Successful pregnancy in cystinosis. JAMA. 1994 Nov 2. 272(17):1327-8. [Medline]. Almond PS, Matas AJ, Nakhleh RE. Renal transplantation for infantile cystinosis: long-term follow-up. J Pediatr Surg. 1993 Feb. 28(2):232-8. [Medline]. Baum M. The Fanconi syndrome of cystinosis: insights into the pathophysiology. Pediatr Nephrol. 1998 Aug. 12(6):492-7. [Medline]. Bendavid C, Kleta R, Long R, et al. FISH diagnosis of the common 57-kb deletion in CTNS causing cystinosis. Hum Genet. 2004 Nov. 115(6):510-4. [Medline]. Cystaran (cysteamine ophthalmic solution) [package insert]. Gaithersburg, MD: Sigma-tau Pharmaceuticals, Inc. October, 2012. Available at [Full Text]. Dohil R, Newbury RO, Sellers ZM, et al. The evaluation and treatment of gastrointestinal disease in children with cystinosis receiving cysteamine. J Pediatr. 2003 Aug. 143(2):224-30. [Medline]. Elenberg E, Norling LL, Kleinman RE, Ingelfinger JR. Feeding problems in cystinosis. Pediatr Nephrol. 1998 Jun. 12(5):365-70. [Medline]. Facts and Comparisons. Cysteamine bitartrate. Drug Facts and Comparisons. 5th ed. St. Louis, MO: Facts and Comparisons; 2000. 590-1. Foreman JW. Metabolic disorders. Pediatric Nephrology. Baltimore, MD: Lippincott Williams & Wilkins; 1994. 537- 57. Gahl WA. Cystinosis coming of age. Adv Pediatr. 1986. 33:95-126. [Medline]. Gahl WA, Balog JZ, Kleta R. Nephropathic cystinosis in adults: natural history and effects of oral cysteamine therapy. Ann Intern Med. 2007 Aug 21. 147(4):242-50. [Medline]. [Full Text]. Gahl WA, Reed GF, Thoene JG. Cysteamine therapy for children with nephropathic cystinosis. N Engl J Med. 1987 Apr 16. 316(16):971-7. [Medline]. Gahl WA, Thoene JG, Schneider JA. Cystinosis. N Engl J Med. 2002 Jul 11. 347(2):111-21. [Medline]. Jonas AJ, Schulman JD, Matalon R, et al. Cystinosis in non-caucasian children. Johns Hopkins Med J. 1982 Sep. 151(3):117-21. [Medline]. Kleta R, Kaskel F, Dohil R, et al. First NIH/Office of Rare Diseases Conference on Cystinosis: past, present, and future. Pediatr Nephrol. 2005 Apr. 20(4):452-4. [Medline]. Levtchenko EN, van Dael CM, de Graaf-Hess AC, Wilmer MJ, van den Heuvel LP, Monnens LA. Strict cysteamine dose regimen is required to prevent nocturnal cystine accumulation in cystinosis. Pediatr Nephrol. 2006 Jan. 21(1):110-3. [Medline]. Markello TC, Bernardini IM, Gahl WA. Improved renal function in children with cystinosis treated with cysteamine. N Engl J Med. 1993 Apr 22. 328(16):1157-62. [Medline]. Saleem MA, Milford DV, Alton H, et al. Hypercalciuria and ultrasound abnormalities in children with cystinosis. Pediatr Nephrol. 1995 Feb. 9(1):45-7. [Medline]. Schneider JA, Katz B, Melles RB. Update on nephropathic cystinosis. Pediatr Nephrol. 1990 Nov. 4(6):645-53. [Medline]. Smolin LA, Clark KF, Schneider JA. An improved method for heterozygote detection of cystinosis, using polymorphonuclear leukocytes. Am J Hum Genet. 1987 Aug. 41(2):266-75. [Medline]. [Full Text]. Sonies BC, Almajid P, Kleta R, Bernardini I, Gahl WA. Swallowing dysfunction in 101 patients with nephropathic cystinosis: benefit of long-term cysteamine therapy. Medicine (Baltimore). 2005 May. 84(3):137-46. [Medline]. Swinford RD, Elenberg E, Ingelfinger JR. Persistent renal disease. Nutritrition in Pediatrics: Basic Science and Clinical Applications. Hamilton, Ontario: BC Decker; 1996. 493-515. The Cystinosis Collaborative Research Group. Linkage of the gene for cystinosis to markers on the short arm of chromosome 17. Nat Genet. 1995 Jun. 10(2):246-8. [Medline]. Theodoropoulos DS, Krasnewich D, Kaiser-Kupfer MI, Gahl WA. Classic nephropathic cystinosis as an adult disease. JAMA. 1993 Nov 10. 270(18):2200-4. [Medline]. Wuhl E, Haffner D, Gretz N, et al. Treatment with recombinant human growth hormone in short children with nephropathic cystinosis: no evidence for increased deterioration rate of renal function. The European Study Group on Growth Hormone Treatment in Short Children with Nephropathic Cy. Pediatr Res. 1998 Apr. 43(4 Pt 1):484-8. [Medline]. Wuhl E, Haffner D, Offner G, et al. Long-term treatment with growth hormone in short children with nephropathic cystinosis. J Pediatr. 2001 Jun. 138(6):880-7. [Medline].